Before, I had a Microsoft Lumia 950 for about one year. My personal smartphone history started with Windows Mobile, iPhone 3, 4 and 4s followed by Windows Phone 8, 8.1 and 10. I was satisfied with Lumia 1020 (mostly because of the good camera) and with the cool Lumia 950. It was not my intention. I thought, I’ll wait for the next Windows Phone generation (maybe at some time there will come a Surface Phone or some other new stuff and that I would buy a new phone then). But the Lumia 950 was unstable, especially when taking photos, I was continuously complaining and annoyed. First, I was making fun of buying an iPhone. Then, going to an Apple Store in the US before flying home, my wife said: You are complaining so much about your phone, pls. buy it now! They had the iPhone 7 in stock, so I bought it (with an ugly bumper, just to have something to protect this much too expensive phone for 850$ – but the Lumia 950 was 650$ one year ago as well…). I had an Android phone for testing, but I have not brought it over my heart to really start using that 150$ device. So, the iPhone was a spontaneous purchase within 5 minutes. There are many aspects, but I want to concentrate on the ones that are most important to me. First, the form factor. The Lumia 950 is slightly larger. Of course, I liked the large and brilliant display. On the other side I did not really like the size of the device, it was not handy. So I went for the (small) iPhone 7. I prefer the iPhone form factor, although I cannot read as well as before, but that’s another story and maybe I need reading glasses at some time. Anyway, each user has different needs. So my priorities were: Taking (good) photos, using about 10 (maybe 20) apps, do little phone calls. Here’s my short list. To clarify one thing: I did not really invest much time in working with iOS and the iPhone. I am sure, there are many things I could reach faster or use more than one finger and such stuff. But to be honest: I don’t want to spend too much time on a Phone, I just want it to work. I am not a heavy phone user and it works for my tasks. For me, there is no real recommendation, just a current conclusion. Using the iPhone does not bring more sense in my life, it’s just another phone. Each device has it’s benefits and disadvantages. As users we need to adapt and learn the most important parts of a new system. 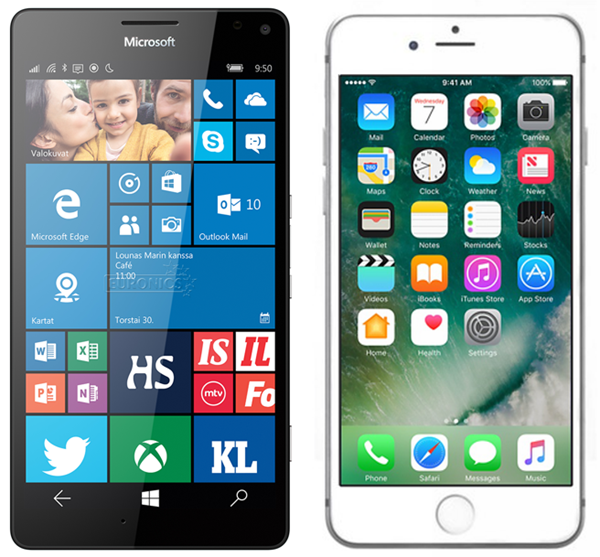 I can live with both phones…... but I like the Windows OS much more. Missing apps are one thing, but stability and battery life (and no story on the future of Windows Phone by Microsoft) were reasons for me to switch. Currently, I am no longer complaining when taking photos – the iOS is much more stable and offers a new world of apps. And the battery life is much much better. Decision made, not regretting it. For now. You need some time to get familiar with iOS, same as Windows. You can download Google Maps and make it offline. There is a notification center which you can configure. Contacts are pretty much the same - you should probably figure it out. Keyboard is configurable as well, you can have Swipe. You can download Here maps and use offline maps as well from the iOS app store.